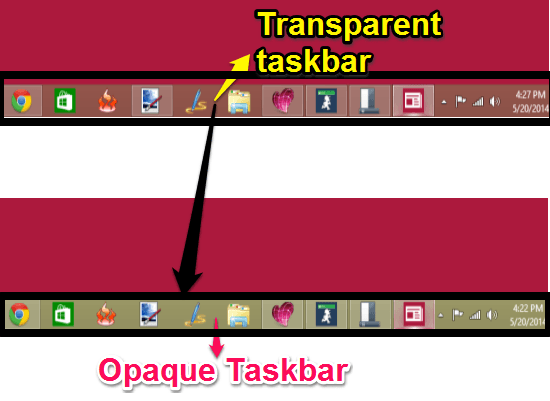 Opaque Taskbar is a free software for Windows 8 that lets you disable the transparency of taskbar and make it opaque. Microsoft has introduced many exciting features like Metro apps, Start Screen, and Charms in its latest OS version, Windows 8. But it has also removed some usual features from this version, which makes Windows 8 quite annoying. This include things like the default Start Menu, which is not present in Windows 8, and the taskbar which is transparent instead of being opaque. We have earlier covered a freeware to add classic Windows Start Menu to Windows 8, and now we have brought another amazing software which lets you disable the transparency of your Windows 8 taskbar with ease. No need to boot your Windows 8 system (but sometimes varies with system to system). The moment you will launch the software, it will instantly make your taskbar opaque (however you can make it transparent whenever you want). This version of Opaque Taskbar doesn’t require any .Net framework libraries. This software need not to be installed and doesn’t consume PC’s resource. Opaque Taskbar is a lightweight software with a download size of 18.88 KB only. If transparent taskbar is annoying for you as well, then you will definitely find this software useful. You can get Opaque Taskbar software free by clicking on the link given at the end of this review. The software is downloaded in Zip file. You need to extract the file first. After extracting the file, launch the software. To launch, go to the Opaque Taskbar folder and then open Native app folder. Double -click on Wintcy (the application file), to launch the software. The best thing is that you don’t need to install this software into your Windows 8 PC. You will find a interface as shown in the below screenshot. 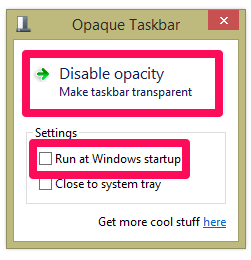 Click on Enable Opacity to make the taskbar opaque. Once you do this the button will toggle to Disable Opacity. Click on it to to disable the taskbar opacity. If you want to make your taskbar opaque even after the system reboots, then click on Run At Windows startup. Opaque Taskbar is one of the best software for Windows 8 to make its taskbar opaque. This software is quite easy to use and has simple interface. You can instantly make the taskbar opaque without doing much. If you want to make the taskbar opaque, then you should definitely give it a try.